Sometimes I think the hardest part of my day job is the constant interruptions. The phone calls and emails are easy to ignore when needed. But people like to just walk into my cubicle and sit next to me. It takes awhile to get back in the groove of a project when interrupted like that. Maybe I need to get a less comfortable guest chair. Oh no, did he install crocodiles as well? That moat is like Windows XP. That moat with crocodiles is like windows Vista. I hope he didn’t install Vist…I mean, crocodiles. Only if you remember to install the razor blade traps as well pihrannas are much like sharks in that regard, they will only attack you if you’re bleeding. Or just remove said chair entirely. i’d be surprised if biff hasn’t put an electric charge through it. I second pieman’s suggestion. The removal of the guest chair would mean that the guest would have to stand. The longer he stays, the longer he stands. Not very comfortable if you ask me. That moat is nowhere NEAR big enough. And it definitely needs crocodiles. I’m kind of wanting to know why Biff needs a moat. Also…I’m guessing the theme for this week is Biff’s job. Good lord, I could use one of those at my job! I like Pieman’s idea, but Biff should add electrtic eels for better effect. Another good way to get people to leave you alone is to be random and weird. They often just smile and nod when I’m around. I need one of these around my PC. Not to keep people out, but to help me concentrate! paycheck, and not even be here. 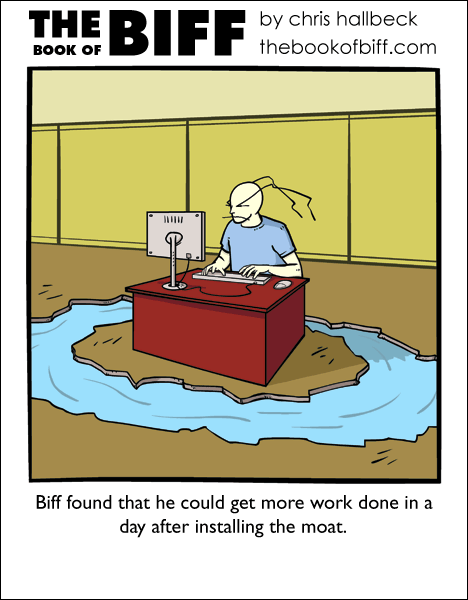 Hmm, I wonder if Biff’s other co-workers will get jealous and have their own moats! Get a chair like Biff’s As Seen On TV Pillow. By cubicle you mean lush, posh office right? I can’t imagine a cubicle having much space for two chairs. You have no clearance to make such an inferrence! It has been shown that biff is crazy enough to fill the entire lower floor with water. I’d just go swimming if I had a moat. Did I mention that I LOVE studying psychology? The theme this week is office week or something like that right? I like the fact that Biff’s computer does not appear to be plugged into anything, unless it’s all under the table. Sure, he keeps visitors away, and if he could get work done he’d be making great efficiency! Trivia bit: As moats were used for the medieval castle’s sewage system, I think large, carnivorous reptiles would be unnecessary to keep out most intruders. Piranha? Electric eels? They both sound nice but my moat would be stocked with hagfish. Mainly because anyone who fell into the moat would not only end up wet, but also covered in slime. At it’d take was one, then nobody’d come near me again.